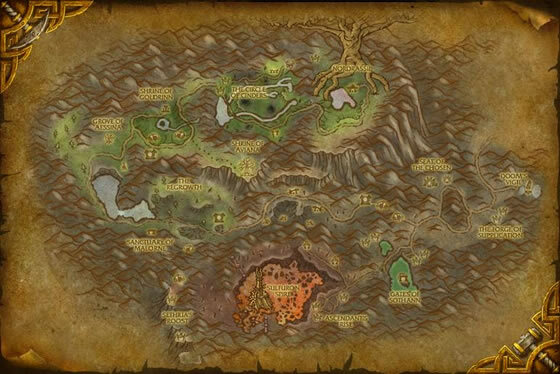 Players must complete the initial quest chain offered upon discovering the Mount Hyjal zone to unlock the quests at the Shrine of Aviana. If far enough along the chain, players will be sent to the shrine with the quest Wings Over Mount Hyjal. Alternatively, players may visit the shrine at a later time to begin the pet quest chain. The Blue Mini Jouster is one of two companion pet rewards for completing the quest chain started at the Shrine of Aviana in Mount Hyjal. The other pet that is offered is the Gold Mini Jouster. While players may only choose one or the other at the end of the quest, as of Patch 4.2 it is possible to obtain the second jouster companion. After completing Egg Wave, a jousting daily will become available. Upon mastering the achievement The 'Unbeatable?' Pterodactyl: BEATEN, players will be mailed a chirping box which contains the jouster pet that was not chosen at the end of the initial quest chain. When summoning this pet, players will do a /cheer emote and a spark of blue lightning will flash as the pet appears. 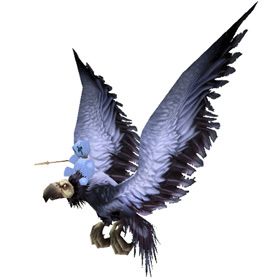 These two pets' low appearance ratings makes me suspect people don't see that there's a doll riding a vulture and wielding a lance! Perhaps their color is not distinctive enough from the wings of the bird mounts they're riding. I guess people do not know you can just quest through Mount Hyjal on a separate toon and get the one you didin't get the first time. I have 4 total, 2 of each. Or, I could not be a dumbass, and read that the posts are PRE-MoP. But anyway, you can get as many of these as you want, up to 3 each, as long as you have 6 toons over level 80 to run through Hyjal to the point you get this quest. Why can't i get the first pet? I've started the daily chain thing can someone help please!!!! I was pleased with the nostalgia of this reminder of "Joust," but it also made me wish that the quest had the precision of control that the arcade game did. But the doll on the mount is certainly good for a giggle factor. Ever since his brother was taken away. This little creature has been nothing short of a handful. The guardians and I have done everything we can to contain his energy, but our efforts have fallen depressingly short. It is now clear. He wants to be with his brother. It took us nearly an hour to get him contained. Please, take him with you. Perhaps some time outside of this cavern will do him good. This thing always makes me chuckle when I see it, the doll on its back is just amusing in its self. As a kid I played Joust at the arcade with my Pops all the time. Many quarters were lost for the joy of it. I was happy to see it inside WoW. The quests was horrid but worth it. I was saddened I had to choose and know I could never get the other. Though once I had pulled out the pet and realized a teddy bear was the "jouster" I just giggled for the rest of the day. Love it! A nice reward, from possibly the worst quest line in the history of WoW. The constant "flap quickly to increase speed" and " ability not ready yet" was very irritating. I have to say that while the pet was worth doing the quest-line, it bothers me that I can't have both on one character. Still, flapping clumsily over a pit of lava is quite fun! I'm very disappointed that this pet doesn't fly. It stays on the ground like the whelplings and parrots, so cannot follow you when you're on a flying mount. Ironic considering that it's a quest reward for flying! I get the splitting of pets along Horde and Alliance lines, but I really wish they would stop having pets that you just have to chose between. It's like they are intentionally *trying* to drive me bonkers. Does it interact with the other gold jousting one?... that would be cool. Unlike its gold counterpart, the blue mini jouster takes a leisurely pace when jabbing its opponent's eyeballs.